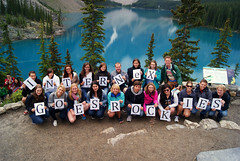 Tomorrow (Friday) West Trek is organizing a after party for the Rockies trip. We have enough free entree passes available at our office, or on Friday eve at 8:30pm at the location. West Trek will show their special made videos, and there is time to say goodbye, hello to others! You can find more information about this event in Facebook! On Saturday August 10th there will be a huge waterfight in the middle of Stanley Park! ‘Who wants to have a big waterfight this summer? Raise your hands, and pull your trigger finger, cause we’re going to get soaked. And no one is going to stop, ’til this town runs dry!’ See their event page for more info ! When: Saturday August 10th at 1 p.m.
Every weekend the city of Vancouver is organizing an event on Granville St. Downtown. Viva Vancouver is lot’s of different activities like salsa dancing, hula hoops and much more! They close Granville St. for car traffic so you can sit and relax on the special placed terrace. Check out the whole calendar on their website. So that’s it! Our recommendations for the sunny weekend. If you are doing other things we would like to hear about this!